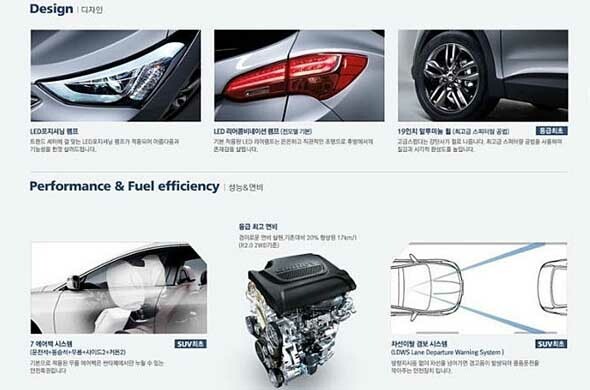 Hyundai Santa Fe Brochure images leaked; new details emerge! 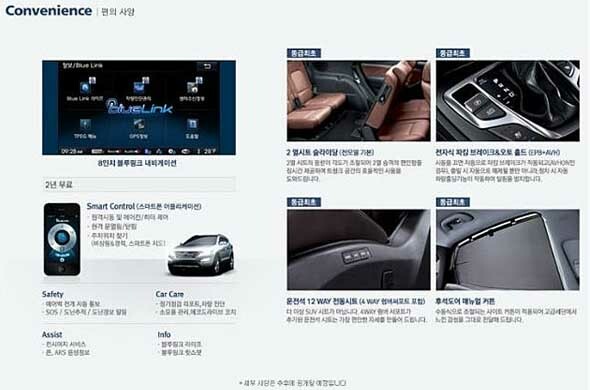 The brochure images of the upcoming Hyundai Santa Fe have been leaked on the internet. Since the Santa Fe is a direct import for the Indian market, we expect the features indicated in the brochure to be carried over to the India-bound Santa Fe as well. The brochure revealed interesting details about the Santa Fe such as a new, powerful 2.2-litre diesel engines and features such as automatic parking, front and rear LED lamps, knee airbag and lane departure warning system and Automatic parking will be the first in the SUV segment, if launched in India-bound model. The upcoming Santa Fe is expected to be powered by a 2.2-litre R-series diesel engine that puts out 221 bhp of power and 500 Nm of torque. The engine power and torque specifications suggest that the upcoming Santa Fe will be more powerful than the Toyota Fortuner and the Mitsubishi Pajero Sport. At present, the Santa Fe sold in India, is powered by a 2.2 litre CRDi diesel engine that makes 195 bhp of power and 420 Nm of torque. 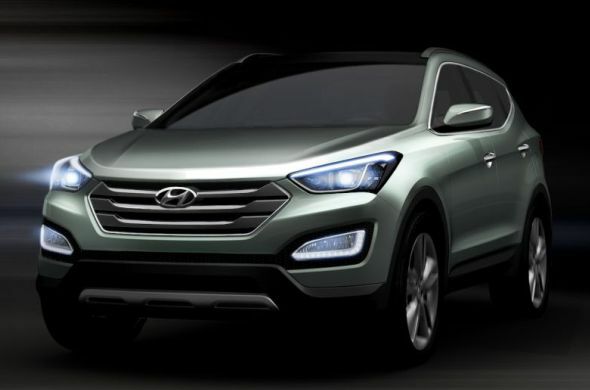 Last week, Hyundai released official images of the next-generation Santa Fe prototype. The new Santa Fe will be unveiled at the New York Auto Show to be held during April 2012. Read more about the New Hyundai Santa Fe here. As per the official images, the new Santa Fe will adopt Hyundai’s ‘Storm Edge’ design concept which is based on the company’s fluidic sculpture. The SUV has Hyundai’s family hexagonal grille as seen on the Verna and the upcoming Sonata. The side profile of the Santa Fe reveals aerodynamic crease lines, pronounced wheel arches and dual tone body color giving it a Sporty look. Expect the rear to have a chunky bumper. The LED tail lamps will slightly resemble the BMW X5. We expect the upcoming Santa Fe to be launched by 2012 end or in 2013. Till then, the present model which is priced between Rs. 21.4 lakh and Rs. 24.36 lakh will continue to sell in the Indian market. Do you think the new Santa Fe with its fresh looks, impressive features and powerful engine could overthrow the mighty Toyota Fortuner? « Hyundai offers benefits worth Rs.28,500 on Santro and Rs.40,000 on i10!